On 23 May the USGS reported that during the previous week one explosion signal from the source at or near Ahyi seamount was detected. Seismic activity had been low since 8 May continuing to indicate that the eruption had possibly paused or ended. Ahyi seamount is one of a long string of submarine seamounts at the northern edge of the Northern Mariana Islands, part of the Mariana Back-arc segment of the Izu-Bonin trench in the western Pacific Ocean. The remote location of the seamount has made eruptions difficult to document, but seismic stations installed in the region confirmed an eruption in the vicinity in 2001. No further activity was reported until a new eruption was detected by seismic stations and felt by divers in the immediate area in April 2014. Volcanic activity in the Commonwealth of the Northern Mariana Islands is monitored by the US Geological Survey's Volcano Hazards Program, and observations are sometimes gathered by NOAA (National Oceanic and Atmospheric Administration) expeditions. The 2014 eruption and follow-up observations from December 2014 are summarized here. The eruption at Ahyi seamount between 24 April and 17 May 2014 (BGVN 39:02; Haney et al., 2014) was first recorded as T-phase signals that were detected by various seismometers in the Mariana Islands. Submarine explosions were also heard and felt by NOAA scuba divers conducting coral reef research on the SE coastline of Farallon de Pajaros (Uracas) Island, about 20 km NW of Ahyi. In the same area, the NOAA crew reported sighting mats of orange-yellow bubbles on the water surface that extended up to 1 km from the shoreline. T-phase seismic signals registered across the Northern Mariana Islands (NMI) seismic network at a rate of approximately 10 per hour until 8 May, and then sporadically until 17 May (Haney et al., 2014). During mid-May, the NOAA ship Hi'ialakai gathered multibeam sonar bathymetry and took three water-column CTD casts (Conductivity, Temperature, and Depth sensor; it gives scientists a precise and comprehensive charting of the distribution and variation of water temperature, salinity, and density). The May 2014 bathymetry revealed that the minimum depth to the summit was about 90 m, notably deeper than the 60 m measured during a 2003 survey. In addition a new crater about 100 m deep had formed at the summit, replacing the summit cone. Also, a distinct landslide chute descended the SE slope 2,300 m, removing material from the head and depositing debris at the base (see figure 4, BGVN 39:02). Significant particle plumes were detected with all three CTD casts, indicating ongoing hydrothermal activity. Plumes with optical anomalies up to 0.4 NTU (nephelometric turbidity units) were found S and W of Ahyi at 100-175 m water depth, corresponding to the depth of the new summit crater. NTU's are light backscattering measurements done by optical sensors in sea water to determine the presence of hydrothermal plumes in the water column. On 4 December 2014, the NOAA Expedition "Submarine Ring of Fire 2014 – Ironman" visited Ahyi, and again used a CTD sensor to assess the hydrothermal status of the volcano. 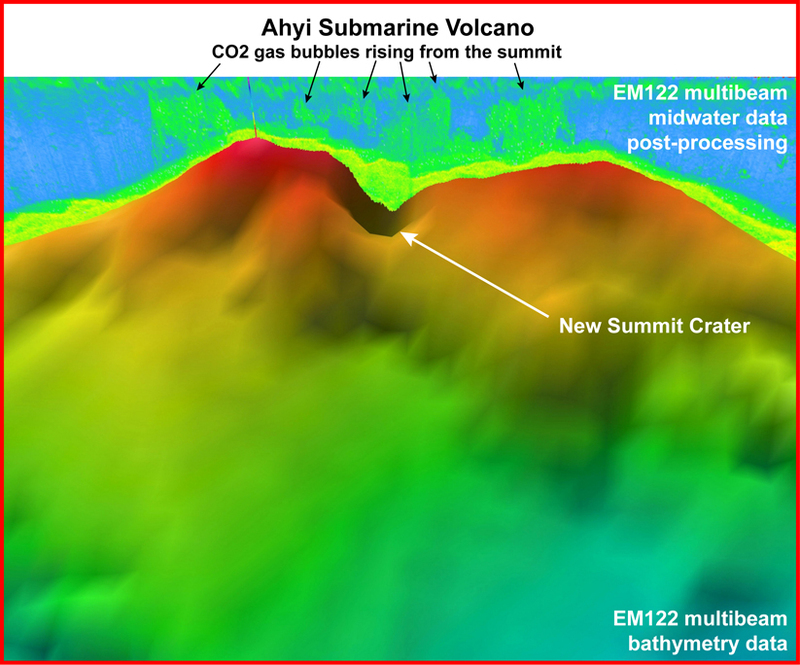 EM122 multibeam bathymetry data imaged CO2 gas bubbles rising from the summit (figure 5), and clearly revealed the new summit crater. When the CTD sensor and sampling package was lowered into the water, it measured a thick plume of particles indicating ongoing hydrothermal activity near 150 m depth, close to the base of the new crater that formed during the eruption in April-May 2014. Figure 5. 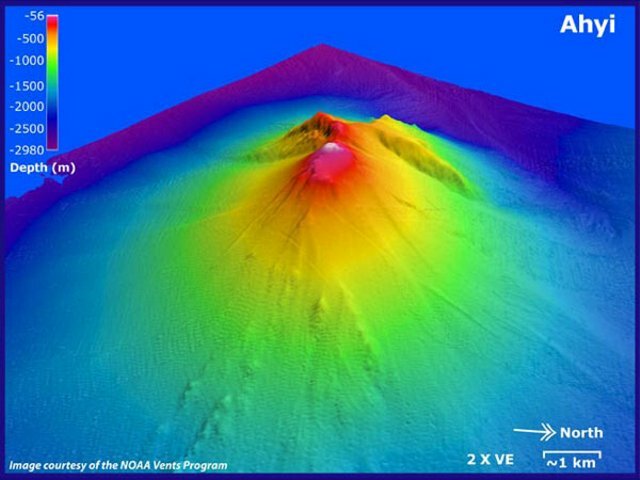 Three-dimensional image of the summit of Ahyi submarine volcano gathered on 4 December 2014 with the mid-water data shown above the new crater created by the April 2014 eruption. The summit crater is ~100 m deep. CO2 bubbles (in green) can be seen rising from most of the summit, suggesting that there is more than one source of venting. This image shows an area 850 m across with depths ranging from 78 (red) to 400 m (blue). No vertical exaggeration. Image courtesy of Submarine Ring of Fire 2014 - Ironman, NSF/NOAA (http://oceanexplorer.noaa.gov/explorations/ 14fire/logs/december04/media/ahyi.html). References: Haney, M. M., Chadwick, W., Merle, S. G., Buck, N. J., Butterfield, D. A., Coombs, M. L., Evers, L. G., Heaney, K. D., Lyons, J. J., Searcy, C. K., Walker, S. L., Young, C., and Embley, R. W., The 2014 Submarine Eruption of Ahyi Volcano, Northern Mariana Islands, American Geophysical Union, Fall Meeting 2014, abstract V11B-4727. Information Contacts: National Oceanic and Atmospheric Administration (NOAA), Office of Ocean Exploration and Research, 1315 East-West Highway, Silver Spring, Maryland, USA (URL: http://oceanexplorer.noaa.gov/welcome.html); US Geological Survey, Volcano Hazards Program (USGS-VHP), 12201 Sunrise Valley Drive, Reston, VA, USA (URL: https://volcanoes.usgs.gov/index.html). On 16 May the USGS reported that during the previous week seismic signals from the source at or near Ahyi seamount had greatly diminished, indicating that the eruption had possibly paused or ended. Scientists aboard the research ship Hi'ialakai conducted water column tests in the vicinity of Ahyi on 15 May and reported no sign of activity, suggesting that the eruption occurred from a nearby volcanic vent and not the summit. The Aviation Color Code remained at Yellow and the Volcano Alert Level remained at Advisory. A helicorder plot from a station on Pagan showed that seismic signals from a source at or near the Ahyi seamount stopped at 1610 on 8 May. An additional isolated event was reported at 1810. Seismic stations on Pagan, Sarigan, Anatahan, and Saipan started recording signals on 24 April that continued at least through 2 May. The source had not been confirmed, but is thought to be at or near the Ahyi seamount. During 4-5 May a helicorder plot from a station on Pagan showed explosive signals at a rate of 20 per hour. Seismic stations on Pagan, Sarigan, Anatahan, and Saipan began recording signals starting at 0635 on 24 April believed to be from an undersea volcanic source. Hydroacoustic sensors on Wake Island suggested that the source is at or near Ahyi seamount, although it was possible that the vent is located at one of the other volcanic seamounts in the area. While conducting coral reef research at Farallon de Pajaros, NOAA divers reported hearing loud explosions and feeling the shock waves. One of the more powerful explosions was felt by the crew as it reverberated through the hull of the ship. On 27 April the Color Code was raised from Unassigned to Yellow. A report issued at 0536 on 30 April noted that seismic activity remained high. The crew of the fishing boat Koyo-maru 5 felt a series of shocks beginning at about 1530 on 15 November, followed by the upwelling of water containing sulfur about 15 km SE of Farallon de Pajaros Island at 20.445°N, 145.03°E. Depths in the area of the activity range from 70 to 200 m. The JMSA reports that sea surface discoloration has been observed there in the past. Since the day before, a larger than normal cloud plume had been observed over Farallon de Pajaros. Information Contacts: JMSA, Tokyo; JMA, Tokyo; T. Tiba, National Science Museum, Tokyo. A short episode of explosive submarine volcanism was recorded 24 April 2001 by the Laboratoire de Géophysique's (LDG) Pomariorio (PMO) seismic station on Rangiroa Atoll, Tuamotu Archipelago. This episode began at 1110 UTC, and ended at 1900 UTC, with more than 40 explosive T-waves at a fairly uniform rate. The wave forms were similar to those of December 1989 (from a source NW of Supply Reef, SEAN 14:12), and suggested a source in the Mariana Islands. LDG scientists identified these explosive events on records from some other IRIS and Freesia stations, and computed a well-constrained location at 20.34°N, 145.02°E with an error of 15 km (figure 1). Figure 1. Map showing Ahyi and other volcanic edifices along part of the Mariana Arc just north of 20°N, 145°E. The location of the April 2001 activity is indicated, as well as activity reported between Farallon de Pajaros and Supply Reef in 1967, 1969, 1979, 1985, and 1989. Contour interval is 200 m; bathymetry is based on US Navy narrow-beam SASS data. Thick black bars show 1985 dredge locations. Scale and volcanic activity locations are approximate. Base map modified from Bloomer and others (1989). The summit of Ahyi lies within this location uncertainty, approximately 10 km N. Ahyi seamount is a large conical submarine volcano that rises to within about 140 m of the sea surface about 18 km SE of Farallon de Pajaros. Water discoloration has been observed over the volcano, and in 1979 the crew of a fishing boat felt shocks over the summit area followed by upwelling of sulfur-bearing water (SEAN 04:11). Regional volcanic activity. Most of the recent historical activity in this area is based on acoustic detection methods from great distances, making exact location determinations difficult. The following presents background information about other volcanoes close to the April 2001 event, with a description of recent volcanism. The small 2-km-wide island of Farallon de Pajaros (also known as Uracas) is the northernmost and most active volcano of the Mariana Islands. Its relatively frequent historical eruptions dating back to the mid-19th century have caused it to be referred to as the "lighthouse of the western Pacific." Flank fissures have fed historical lava flows that form platforms along the coast. Summit vents have also been active during historical time, and eruptions have been observed from nearby submarine vents. Aerial observations of fuming were reported in July 1981 (with discolored water), August 1990, and May 1992. Makhahnas seamount, which rises to within 640 m of the sea surface, lies about 10 km SW. A possible eruption during March-April 1967 on the SW flank of this seamount was identified on the basis of T-phase recordings by Norris and Johnson (1969). Supply Reef is a conical submarine volcano that rises to within 8 m of the sea surface. The seamount lies about 10 km NW of the Maug Islands, the emergent summit of a submarine volcano that is joined to Supply Reef by a low saddle at a depth of about 1,800 m. Several submarine eruptions have been detected by sonar signals originating from points very approximately located at distances of 15-25 km NW of Supply Reef. An event in March 1969 was detected using T-phase recordings and located by the crew of a fishing boat who heard explosion sounds and saw water discoloration (CSLP Cards 528 and 534). Activity in August-September 1985 (SEAN 10:09 and 10:11) and September and December 1989 (SEAN 14:10 and 14:12) were in the same approximate location, 30 km S of Farallon de Pajaros, about midway between Makhahnas and Supply Reef. Both of these events were identified and located using T-phase data, but discolored water was also observed during the 1985 event by an airline pilot. References. Bloomer, S.H., Stern, R.J., and Smoot, N.C., 1989, Physical volcanology of the submarine Mariana and Volcano arcs: Bulletin of Volcanology, v. 51, p. 210-224. Norris, R.A., and Johnson, R.H., 1969, Submarine volcanic eruptions recently located in the Pacific by Sofar hydrophones: Journal of Geophysical Research, v. 74, no. 2, p. 650-664. Information Contacts: Olivier Hyvernaud, Laboratoire de Géophysique, PO Box 640, Pamatai, Tahiti, French Polynesia. Ahyi seamount is located ~20 km SE of Farallon de Pajaros and was discussed in the Bulletin associated with volcanic unrest in 1979 (SEAN 04:01) and in 2001 (BGVN 26:05). The evidence for a 2014 eruption at Ahyi seamount includes seismicity, noises heard by divers and felt aboard a vessel in the area, and a follow-up research cruise to Ahyi that measured a hydrothermal plume and significant bathymetric changes since the last survey in 2003. This report is revised from an earlier version. The U.S. Geological Survey (USGS) reported that, beginning about 0635 local time on 24 April 2014 (2035 on 23 April 2014, UTC), seismometers in various locations in the Mariana Islands began recording T-phase signals interpreted as stemming from an undersea eruption in an area to the N of Pagan island near the island of Uracas (also known as Farallon de Pajaros). Note that throughout this report, at the suggestion of William Chadwick of NOAA, 'T-phase signals' have been used in lieu of 'earthquakes' since all the eruption-related signals were hydroacoustic (from underwater explosions) rather than seismic body-waves. See the final section of this report for a brief definition of T-phase waves. The eruption was ultimately tracked to Ahyi seamount (figures 2 and 3). Figure 2. Map of the western Pacific margin showing the Northern Mariana Islands with the location of Ahyi volcano added. Original map from Magellan Graphix (1957). Figure 3. (left) A bathymetric map showing the islands and seamounts making up the Mariana island arc. The rectangular box on that map delineates the N part of the arc that is shown on the map at right. (right) A larger scale bathymetric map that highlights features in the vicinity of Ahyi seamount; within the yellow-lined box is the islands unit of the Mariana Trench Marine National Monument. Maps courtesy of Susan Merle, Oregon State University and NOAA-PMEL. Seismometers that recorded the 2014 T-phase signals included those on Saipan, Pagan, Sarigan, and Anatahan islands (figure 2). The USGS reported recording T-phases during 24 April through 8 May 2014. During this same period, hydroacoustic sensors on Wake Island (~2,300 km ENE from Ahyi) also received signals. The recorded events all indicated that the source of the hydroacoustic signals was at or near Ahyi seamount, but the accuracy of the initially determined locations remained uncertain because there are other active volcanic seamounts in the area. On 25 April 2014 the Aviation Color Code was raised by the USGS from Unassigned (Volcanic Alert Level: Unassigned) to Yellow (Volcanic Alert Level: Advisory). As of 29 May, USGS had received no reports of an eruption plume or any evidence that eruptive products had reached the surface. Satellite images showed nothing indicative of a volcanic eruption. On 29 May the Aviation Color Code was lowered by the USGS to Unassigned (Volcanic Alert Level: Unassigned). At the time of the T-phase signals in April 2014, submarine explosions were heard and felt by scuba divers conducting coral reef research in the area. Chip Young, leader of the Hi'ialakai expedition working in the area as part of a coral reef survey by the NOAA Pacific Islands Fisheries Science Center (PIFSC), provided the following information on 28-29 April 2014. At this stage, the source of the signals was still a mystery. "While we were diving [on 26 April at Farallon de Pajaros (FDP)] we could hear eruptions underwater. It wasn't casual, in fact, it sounded like bombs exploding with the concussion felt through your body. I don't know how close we were to the event, none of the…divers saw volcanic activity, but at least one explosion was so powerful, that it reverberated through the hull of the ship and the crew onboard thought that something had happened to the ship (at the time they didn't realized we too were hearing these explosions under water)." "The first divers' comments about hearing something underwater started at Asuncion (4/24-4/25). We were at FDP on [26 April] and to my best guess, the massive explosion that I previously wrote about occurred 0100-0230 26 APR 14 UTC on the SE side of FDP. There were plenty of other explosions throughout the day, but that was the largest one I experienced. There were conglomerates/mats of orange+yellow bubbles on the surface of the water on the SE coastline of FDP as well. We had a very calm day at FDP, so the mats/sludge stretched on for 20-30 ft [~7-9 m] or more. These could have been from Ahyi, but visual disturbances near Ahyi weren't specifically made because we passed there in the early [morning] on the way to FDP and then in the evening on the way to Maug. We did hear explosions underwater at Maug too. I heard distant explosions, which I assumed were from FDP, but there were closer ones too. Not as violent as the sounds we heard at FDP, but 'cracks' for sure." During the height of the T-phase swarm, explosive signals from the underwater eruption source in the vicinity of Ahyi were occurring at a rate of ~20 per hour. On 16 May 2014, the USGS reported that over the preceding week, T-phase signals had greatly diminished. Verification of 2014 Ahyi eruption. A subsequent expedition took place during 12-18 May, after the eruption T-phases had stopped. This expedition, led by Chip Young and Dave Butterfield aboard the R/V Hi'ialakai, was working at Maug island (~50 km SSE of Ahyi) and conducted several water-column CTD (conductivity-temperature-depth) casts in the area. They found a hydrothermal plume coming from Ahyi. In addition, they collected new bathymetric data over the summit of Ahyi, which showed the depth changes that confirmed that Ahyi was indeed the source of the 2014 eruption. According to William Chadwick, NOAA surveyed Ahyi in 2003, measuring a summit depth of 60 m. After the T-phase signals declined in mid-May 2014, the NOAA ship Hi'ialakai went over the summit and the new minimum depth was found to be 75 m. In addition, a new summit crater is evident in the 2014 bathymetry that is ~95 m deep. Bloomer and others (1989) noted a value of 137 m as Ahyi's summit depth, based on U.S. Navy Sonar Array Sounding System (SASS), an early form of multibeam sonar. This pre-2003 summit depth value is probably less accurate and therefore does not necessarily represent a true depth change between the SASS survey and 2003. Figure 4B shows the results of multibeam sonar bathymetry over Ahyi's summit collected by the Hi'ialakai in 2014. This map was compared to their previous survey in 2003 (figure 4A) and used to compose a third map (figure 4C) showing depth differences between the two surveys. In essence, the summit elevation dropped by 25 m; a crater had developed with a floor at a depth of 195 m; and a conspicuous landslide chute descended to at least 2,300 m depth along the SE slope. Up to 125 m of material was removed from the head of the landslide chute, and constructional deposits downslope were up to 40 m thick. The map analysts noted that even though the 2014 re-survey was limited and produced an incomplete look at the entire Ahyi edifice, the changes were very clear and indicated recent eruptive activity at Ahyi. Figure 4. Three maps (frames A, B, C) showing multibeam bathymetry and analyses of bathymetric changes between surveys of 2003 and May 2014 of Ahyi volcano (white areas signify lack of data). (A) Bathymetry of Ahyi volcano conducted 2003 showing a cone with summit at a depth of 65 m (Merle and others, 2003). (B) Ahyi map from survey conducted May 2014. The cone was gone and was replaced by a new crater with a rim at 90 m depth and a floor at 195 m depth. The current minimum summit depth for the volcano at 75 m resides near the location on figure 4B labeled "crater rim ~90 m." Extending SSE from the new crater, the research disclosed a new landslide chute descending to at least 2,300 m depth. (C) Depth changes comparing 2003 and 2014 maps. As defined on key at lower left, the cool colors signify material removed; green, no change; and warm colors, material added. Labels indicate elevation changes disclosed in the comparison (e.g. -20 m means this area is 20 m lower on the 2014 map than on the 2003 map). Map courtesy of Susan Merle, Oregon State University and NOAA/PMEL. T-phase waves: According to Okal (2011) "T phases are defined as seismic recordings of signals having traveled an extended path as acoustic waves in the water body of the oceans. This is made possible by the 'Sound Fixing and Ranging' (SOFAR) channel, a layer of minimum sound velocity acting as a wave guide at average depths of 1,000 m. It allows the efficient propagation of extremely small signals over extremely long distances, in practice limited only by the finite size of the ocean basins." The use of T-waves has led to much improved diagnosis of submarine vent locations. For example, Fox and Dziak (1998) described the detection of intense seismicity the NE Pacific Ocean using the T-phase Monitoring System developed by NOAA/PMEL to access the U.S. Navy's SOund SUrveillance System (SOSUS) in the North Pacific. Dziak and Fox (2002) discussed monitoring of hydroacoustic signals from the Volcano Islands arc, S of Japan (just N of the N Mariana Islands shown in figure 2), a region with frequent submarine eruptions. The signals are characterized by a narrowband, long-duration, high-amplitude fundamental centered at 10 Hz with three harmonics at 20, 30, and 40 Hz. The hydroacoustic (T-wave) signals are consistent with harmonic tremor signals observed using traditional seismic methods at active subaerial volcanoes throughout the world. References. Bloomer, S.H., Stern, R.J., and Smoot, N.C., 1989, Physical volcanology of the submarine Mariana and Volcano Arcs, Bulletin of Volcanology, v. 51, pp. 210-224. Bloomer, S.H., Stern, R.J., Fisk, E., and Geschwind, C.H., 1989, Shoshonitic Volcanism in the Northern Mariana Arc 1. Mineralogic and Major and Trace Element Characteristics, Journal of Geophysical Research, v. 94, no. B4, pp. 4469-4496. Dziak, R.P., and Fox, C.G., 2002, Evidence of harmonic tremor from a submarine volcano detected across the Pacific Ocean basin, Journal of Geophysical Research, v. 107, no. B5, p. 2085. Fox, C.G., and Dziak, R.P., 1998 (December), Hydroacoustic detection of volcanic activity on the Gorda Ridge, February-March 1996, Deep Sea Research Part II: Topical Studies in Oceanography, v. 45, no. 12, pp. 2513-2530 (DOI: 10.1016/S0967-0645(98)00081-2). Magellan Graphix, 1997, Map: Northern Mariana Islands (territory of US) (URL: http://www.infoplease.com/atlas/state/northernmarianaislands.html). Merle, S., Embley, R., Baker, E., and Chadwick, B., 2003, Submarine Ring of Fire 2003 - Mariana Arc R/V T.G. Thompson Cruise TN-153, February 9-March 5, 2003, Guam to Guam, Cruise Report, NOAA-PMEL (URL: http://www.pmel.noaa.gov/eoi/marianas/marianas-crrpt-03.pdf). Okal, E.A., 2011, T Waves, in Gupta, H.K. (ed), Encyclopedia of Solid Earth Geophysics, pp. 1421-1423, Springer Netherlands (DOI: 10.1007/978-90-481-8702-7_165). USGS, 2014 (30 April), Northern Mariana Islands Information Statement, Wednesday, April 30, 2014 5:36 AM ChST (Tuesday, April 29, 2014 19:36 UTC) (URL: http://volcanoes.usgs.gov/activity/archiveupdate.php?noticeid=10031). USGS, 2014 (1 May), A new submarine eruption in the Northern Mariana Islands: could it happen here?, Hawaii Volcano Observatory (URL: http://hvo.wr.usgs.gov/volcanowatch/view.php?id=226). USGS, 2014 (16 May), Current Alerts for U.S. Volcanoes, Northern Mariana Islands Weekly Update, 16 May (URL: http://volcanoes.usgs.gov/nmi/activity//status.php). USGS, 2014 (23 May), Northern Mariana islands Weekly Update, 23 May 2014 (URL: http://volcanoes.usgs.gov/nmi/activity/index.php). Information Contacts: NOAA Pacific Marine Environmental Laboratory (NOAA-PMEL), 7600 Sand Point Way NE, Bldg #3, Seattle, WA 98115 (URL: http://www.pmel.noaa.gov/); William W. Chadwick and Susan Merle, NOAA-PMEL Earth-Ocean Interactions Program and Oregon State University; David A. Butterfield, University of Washington and NOAA-PMEL; Charles (Chip) Young, NOAA Fisheries, Pacific Islands Fisheries Science Center (PIFSC); Matt Haney, U.S. Geological Survey (USGS), Alaska Volcano Observatory (AVO), Anchorage, AK 99508; USGS Volcano Hazards Program (URL: http://volcanoes.usgs.gov/nmi/activity/); and CNMI Emergency Management Office (URL: http://www.cnmihomelandsecurity.gov.mp/). Ahyi seamount is a large conical submarine volcano that rises to within 75 m of the sea surface about 18 km SE of the island of Farallon de Pajaros (Uracas) in the northern Marianas. Water discoloration has been observed there, and in 1979 the crew of a fishing boat felt shocks over the summit area of the seamount, followed by upwelling of sulfur-bearing water. On 24-25 April 2001 an explosive eruption was detected seismically by a station on Rangiroa Atoll, Tuamotu Archipelago. The event was well constrained (+/- 15 km) at a location near the southern base of Ahyi. An eruption in April-May 2014 was detected by NOAA divers, hydroacoustic sensors, and seismic stations. There is no Deformation History data available for Ahyi. There is no Emissions History data available for Ahyi. Ahyi seamount (upper right) is a large conical submarine volcano that rises to within 137 m of the sea surface about 18 km SE of the island of Farallon de Pajaros (left-center). At various times since 1979, water discoloration, felt shocks followed by upwelling of sulfur-bearing water, and a seismically detected submarine eruption have been reported at or near Ahyi seamount. 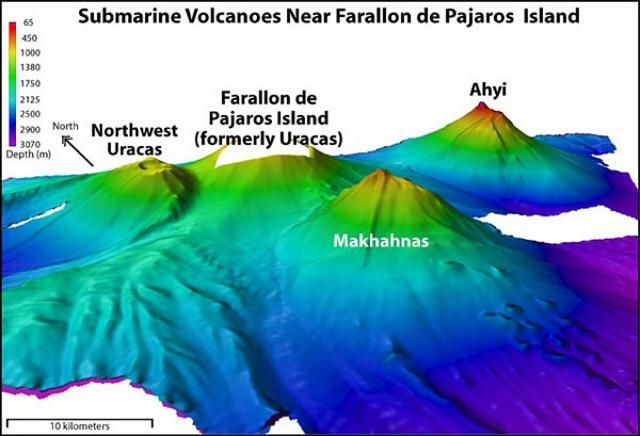 Two submarine volcanoes on the flanks of Farallon de Pajaros, Northwest Uracas and Makhahnas, are seen in this NOAA bathymetric image. Image courtesy of NOAA, 2003 (http://oceanexplorer.noaa.gov/explorations/03fire/logs/mar02/media/nikko.html). Ahyi submarine volcano is seen in a bathymetric view looking from the NE with two times vertical exaggeration. Ahyi seamount is a large conical submarine volcano that rises to within 137 m of the sea surface about 18 km SE of the island of Farallon de Pajaros (Uracas) in the northern Marianas. Water discoloration has been observed over the submarine volcano, and an explosive eruption was seismically detected in April 2001. The Global Volcanism Program has no maps available for Ahyi. There are no samples for Ahyi in the Smithsonian's NMNH Department of Mineral Sciences Rock and Ore collection. Large Eruptions of Ahyi Information about large Quaternary eruptions (VEI >= 4) is cataloged in the Large Magnitude Explosive Volcanic Eruptions (LaMEVE) database of the Volcano Global Risk Identification and Analysis Project (VOGRIPA).